Radon is found all over the US, and can get into any type of building — homes, offices, and schools — which result in a higher indoor radon level. However, you and your family are most likely to get your greatest exposure at home, where you spend most of your time. 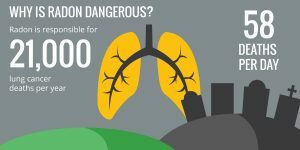 Why you should test for radon? Testing is inexpensive and is the only way to know if you and your family are at risk from radon. EPA and the Surgeon General recommend testing ALL homes below the third floor regardless of type of foundation the house is built on, basement, crawls space or slab on grade. The EPA recommends that you use a trained and qualified professional to test your home. Our inspectors are fully certified by NRSB for radon testing. Our in-house lab allows us to provide total quality control over the test results, and to provide results the same business day when the detectors have been retrieved. Our radon results and reports are fully recognized in real estate transactions. If you schedule a radon test with your home inspection, the inspector will place two detectors in the lowest livable area of the home either prior to your inspection or when he arrives the day of the inspection. Per EPA guidelines, the detectors must remain in place for a minimum of 48 hours. Once the detectors have been retrieved, the inspector will analyze the results using our in-house laboratory. A detailed report is emailed the same business day of retrieval. Windows and doors must be kept closed at least 12 hours prior to the placing the testers and throughout the test period. Doors may be opened during the test for normal entering and exiting. Windows must be kept closed because, when open, they can raise or lower radon levels. Please do not operate any whole house fans, fireplaces or wood stoves, unless they are a primary heat source, and keep all dampers closed if not in use. You may operate the heating and air conditioning normally. The dryer, range hood, bathroom fan or attic ventilating fan can be operated. This equipment should only be operated normally because any exhaust fan or any combustion appliance may increase the negative pressure in the dwelling, which can raise or lower any radon concentration. Please do not touch, cover, move the detectors, tampering with the detectors or refusal to follow these protocols will void the test. What your radon test results mean? The concentration of radon in the home is measured in picocuries per liter of air (pCi/L). The average indoor radon level is estimated to be about 1.3 pCi/L, and about 0.4 pCi/L of radon is normally found in the outside air. If your radon level is below 4.0 pCi/L, you do not need to take action. However, radon levels less than 4.0 pCi/L still pose some risk and in many cases may be reduced. If the radon level in your home is between 2.0 and 4.0 pCi/L, the EPA recommends that you consider fixing your home. What if my results are high? If your radon level is 4.0 pCi/L or greater, remediation is needed. 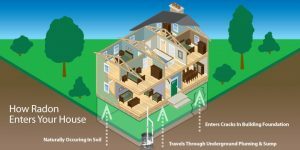 There are several proven methods to reduce radon in your home, but the one primarily used is a vent pipe system and fan, which pulls radon from beneath the house and vents it to the outside. This system, known as a soil suction radon reduction system, does not require major changes to your home. Sealing foundation cracks and other openings makes this kind of system more effective and cost-efficient. Similar systems can also be installed in houses with crawl spaces. We use the E-PERM® System, a passive device used to measure radon concentrations in the air. It consists of a charged Teflon disk or electret which is screwed into an ionization chamber to establish an electrostatic field. When this happens a passive ionization chamber is formed. Over time, radon gas diffuses passively into the chamber. The alpha particles emitted from the decay of radon ionize the air molecules. The ions are attracted to the charged surface of the electret and over time neutralize and reduce the charge that was originally present. The electret charge is measured before and after the exposure, and the rate of change is proportional to the concentration of radon in the area.